You will see siblings and friends from other bunks all the time, as the entire camp community comes together several times a day. From flagpole and meals to option breakout, general swim, and certain all camp programs. And if it’s not a typical day, your child will be participating in an All Camp Program, Shabbat, or Out of Camp Trip with friends old and new! Our Junior campers participate in one Bunk Period every day. A Bunk Period is assigned by bunk to expose campers to the various program areas at camp as well as facilitate group bonding. In addition to a Bunk Period, our Junior campers will participate in Swim Instruction in our indoor heated pool every day. Our Inter campers will alternate daily between a Bunk Period and Swim Instruction. In contrast to Bunk Periods, Option Period allow the camper to choose the activities that they want to participate in. Our option programming is instructional, curriculum-based, and most importantly FUN! Campers will participate in 3 consecutive days of their choice activity aiming at skill building and development. 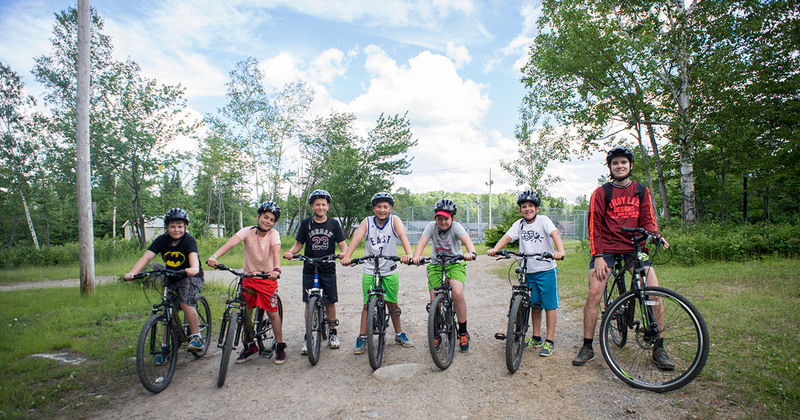 Our curriculum-based programs, taught by our knowledgeable specialists, will allow each camper to develop skills at their own pace, improve skills at their desired activity choice, and interact with children from different bunks. Evening programs at CBB typically happen within the different units. The time allows the opportunity for the units to bonds by participating in creative activities full of tradition. Other evening programs can include camp-wide social dances, plays, or shows, as well as inter-unit programs where several units combine their efforts to participate in larger scale activities while still remaining true to the traditional base.